The times are past that you could just walk into Immigration and be out within 30 min. Every foreigner staying in Chiang Mai long term sooner or later has to deal with the Chiang Mai Immigration Office. In fact, in a way it is fair to say that every long term foreign resident in Chiang Mai is "at the leash" of Immigration: they can decide to kick you out of this country at any time. 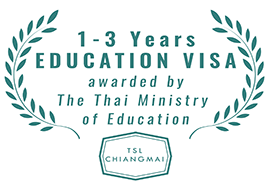 Dealing properly with Immigration is therefore essential for every foreign resident in Chiang Mai. Needless to say to most foreigners (but some foreigners forget it): Immigration is not a business in the hospitality sector such as a hotel. Therefore, they do not owe foreigners a service and they are not here to fulfill your needs. First and foremost, Immigration is part of the Royal Thai Police force and all foreigners are here because they allow you to stay. So, when dealing with Immigration it's important to have your papers in order and always stay friendly and polite. Occasionaly, some foreigners get upset due to the long waiting queues, the lack of organisation and logic with regards to policies, papers and procedures, and acting it out they may have some unpleasant surprises. 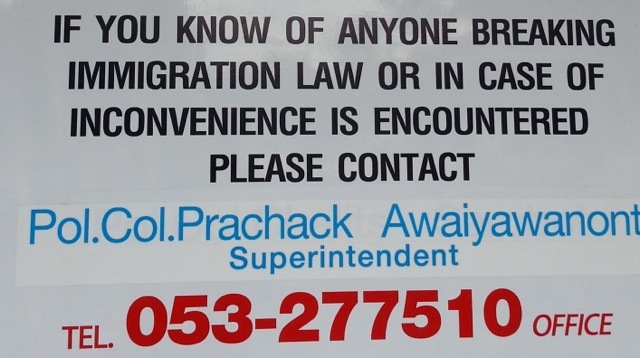 Immigration is not a hospitality organisation, it's police and you'd better not have enemies in Thailand. Since a few years, the Chiang Mai Immigration Office is usually very, very busy. Crowds are queuing up outside of the office from early in the morning 6 or 7 am, and at times even up until the road. For this reason, Immigration gained itself the nickname 'the Zoo' amongst some groups of foreigners, and indeed waiting times can easily be 2-4 hours. Nowadays, Immigration works with a queue system. 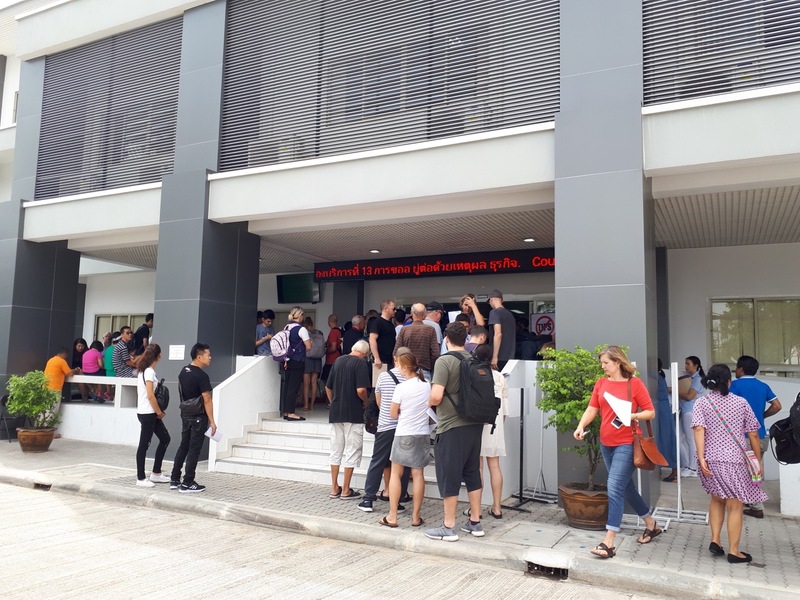 The doors open at 7:30am but people queue up before that to get the first ticket numbers. The ticket number is issued in order of entrance / queue and depends also on your visa matter. There are time slots during the day for ticket numbers to be handled, for example all ticket numbers up until 250 will be treated in the morning before lunch break and all ticket numbers from 250 up in the afternoon. When you present your case and get a ticket number, the officer in charge will tell you roughly what time you have to get ready. How to deal smoothly with Immigration? First and foremost, distinguish what kind of visa matter you have: a relatively simple one or a more extensive one. More extensive visa matters: most other issues, especially application of first / second entry of a 1-year non-immigration visa. If you know at least 100 days in advance that you have to go Immigration, you can book a reservation online. 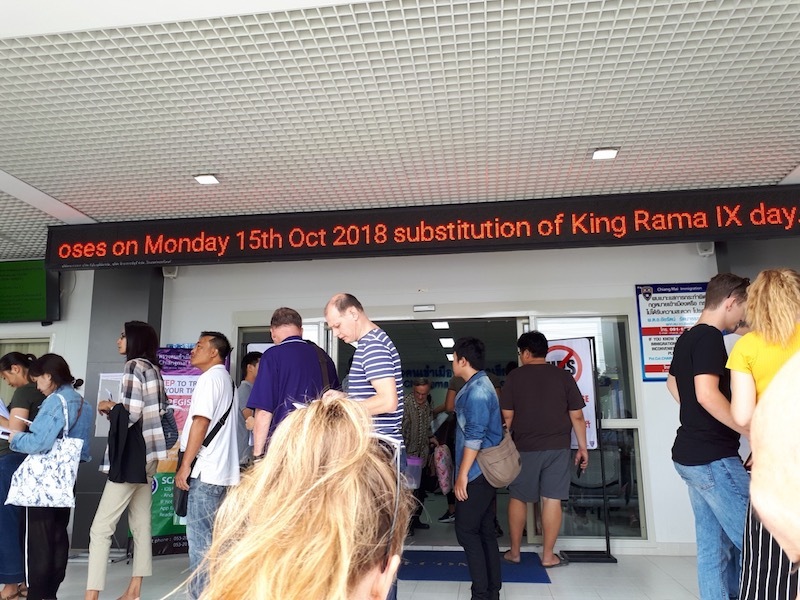 This is Chiang Mai's Immigration's latest attempt to somehow offer you more convenience dealing with the immense waiting queues. 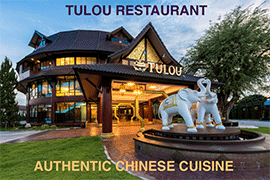 Pity this site (www.chiangmaiimm.com) is entirely in Thai (even though it advertises several language modules), and also a pity that it doesn't allow you to book a reservation within 100 days, because most foreigners probably can't plan that far ahead and also most visa matters will occur within 90 days (such as the usual 90-day reporting and the maximum stay of one entry which is also 90 days). So after you got your new stamp and want to remind yourself of the next time you have to report to Immigration, it's already too late because you have to book at least 100 days in advance. It doesn't really make sense, but that's often with Thai rules and practises, you just have to follow it. If you can't book a reservation online, you simply have to queue up. Depending on your visa matter and how much time you have, you can try at different times of the day. If your visa issue is more extensive and/or you don’t have much time before expiry of your current visa, you must be sure to get it done and then the only sure way is to queu up early in the morning about 7-7:30am. You can also deliberately choose to go a little later, say 8-9am, then most likely you'll get a ticket number for the afternoon and you can just chill out in the morning. If your visa issue is relatively simple and/or you still have time before expiry of your current visa, you could give it a wild try and just walk in during the afternoon at say 2 or 3pm. Chances are that most of the queues are gone and you can get things done within just 2 hours. Most heavy queues form early in the morning (6, 7 or 8am), but but if you add up all the time involved including waiting until the office actually opens, you may end up spending just as much time (3-5 hours for example) as when you arrive there later in the day. Before you go, make sure you have all your papers prepared. You can still make copies of some relevant pages in your passport at the back of the office (2 baht per copy) or even make passport pictures, but it'll be cheaper and faster if you got that done already. Check our list of standard requirements for visa. Procedures at the office aren't always clear, for example sometimes they install a ticket issuing machine at the back and at other times you simply have to walk up to the central counter (not well indicated) and present your passport and visa application case. At all times, stay polite and friendly or at least neutral to the officers in charge, some foreigners lost their temper and got a red stamp in their passport telling them to leave immediately. It's hard to get update information from the authorities, even the Chiang Mai Immigration site is not update and/or translated into English, but at least it's a start and you can download some visa application forms here. Besides the obvious visa matters, there are other matters that could bring you to the Chiang Immigration Office. For example, a Letter of Residence or otherwise called a Residence Certificate. This (one of the documents of) what you need to show to the Thai authorities when buying a motor cycle or car. Strange enough, you don't need a Letter of Residence when buying a much more expensive property such as a condominium. And strange enough, you can also not use the title deed of your own condominium as a proof of residence to get the Letter of Residence to buy a scooter or car (but you can use you rental contract for it) . Still following it? Again, there is often not much logic to Thai rules, you simply just have to get what they want and then everyone is happy. Location: Chiang Mai Immigration now has only one office located near the Airport, just after Airport Plaza. The old, temporary office in Promenada is now entirely closed. Official opening times: from 8:30am to 4:30 or 5pm. Any chance there's an address available so we can find the place. Google Maps only wants to give me the old location. We (five people) were in the immigration office Jan 2019 and it took only 45 minutes to extend our visas by 30 days. We were suprised! Service has become better. Common misconception that immigration isn't there to service you. Of course they are. By definition, they are providing a service, and if you're going to provide a service, it should be done comfortably and properly. Don't try to make nonsense see excuses for these guys. And this is one of the main reasons we moved to South America, specifically the north coast of Peru, after living in CM for three years. Here, it took us two months to get a retirement visa and it is good for life. No more visits to immigration. 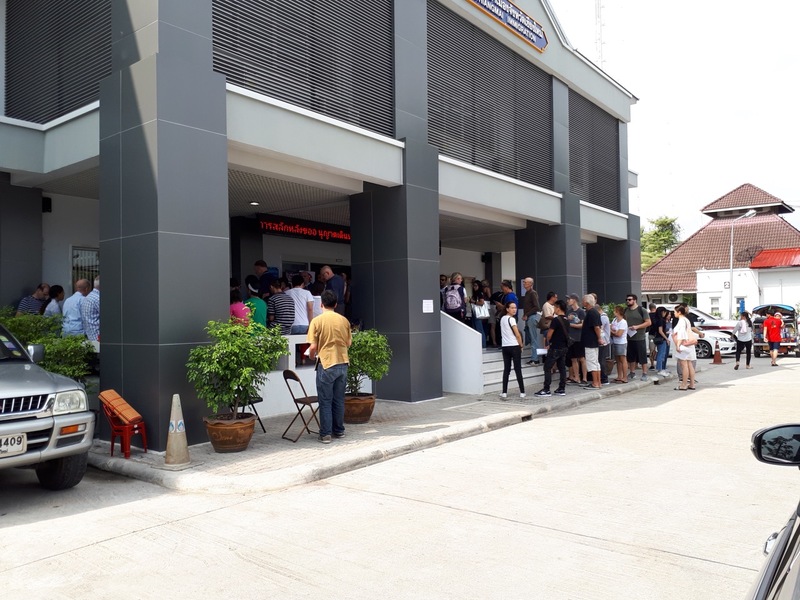 I was at Chiang mai Immigration this morning to renew my retirement visa after arriving at 5.00 am - people had been lined up since midnight and were still turned away. One lady had been there three days running and not been processed. Her visa was due to expire that day. Quite a few elderly people had been waiting for many hours in the dark with toilets locked as well. Very rudimentary seating for a few people only was available. The system used to be a little better a few years ago. What has happened to the legendary Thai respect for the aged? During October 2017, when my one year visa was extended the Immigration Department was notified of my address, which remained the same for 9 years. No notice was given that they wanted an up date of the Notification of address form. Now when the 90 day report was done they said they want to fine us for breach of this regulation. They made the change without informing us. We are very traumatized because we always try to stick to all the rules and be on time and correct. 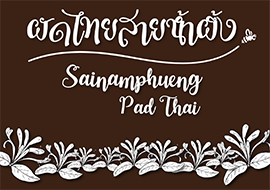 How can we find out what are the changes when the websites are in Thai language? It really does make you wonder ??????? Officially, every foreigner must be registered by the landlord according to the TM.30 form procedure. However, if you don't need to go to Immigration during that period (for example to ask for a visa extension), then you will probably not experience any trouble. The problem is when you need a service from Immigration and then they find out that you haven't been properly registered. In practice, some foreigners or landlords refrain from registration (confirm by Immigration), however it's not the official norm. I will stay in Chiang Mai 29 days do i need a registration by immigration ? It is no longer possible to book an appointment on-line. That was discontinued 3 months ago. They are only processing 20 retirement extensions a day, and it is now the norm for people to arrive there at 4.00am to obtain a slot number. Those who do manage to obtain a number in the lucky draw should expect to be hanging around for up to14 hours to complete the process. 90 day reporting slot numbers are usually gone by 8.00am. 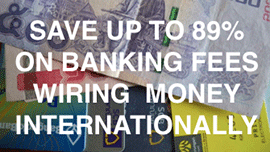 Thanks for the info your site provides to expats.